Ricky arrived at our facility all smiles. 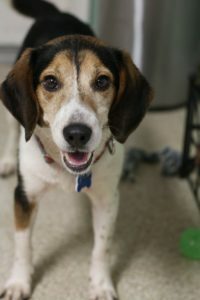 We are still getting to know him but feel free to stop by our kennel and see for yourself! He will make a wonderful companion. You can visit our kennel during adoption hours. Mixed breed dogs are generally healthier than purebred because they draw from a broader gene pool. When adopting a mixed breed dog, focus more on personality rather than breed. This can help so that you appreciate the dog even more. Love him on his own terms and he will love you back more. This entry was posted on September 12, 2018 at 7:38 am and is filed under All News, Anne Arundel News, Calvert News, Charles News, Community, County, Good News, More News, Prince George's News, St. Mary's News, Wednesday's Pet, z 600X120 Top Ad Bottom. You can follow any responses to this entry through the RSS 2.0 feed.